I would be the first one to admit that although I do love cooking and enjoy my food immensely, there are days, like everyone else, when I don’t want to be standing slavishly over the stove stirring sauces and checking the oven every five minutes. 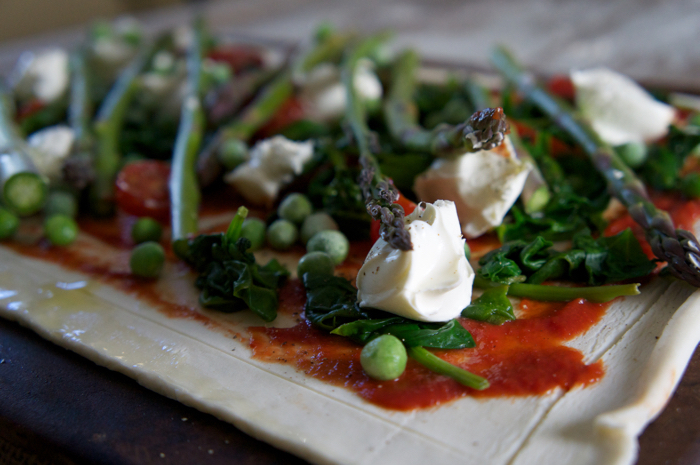 These are the days when shop bought puff pastry comes to the rescue, it can be used for both for savoury and sweet dishes, which can be rustled up at the drop of a hat. 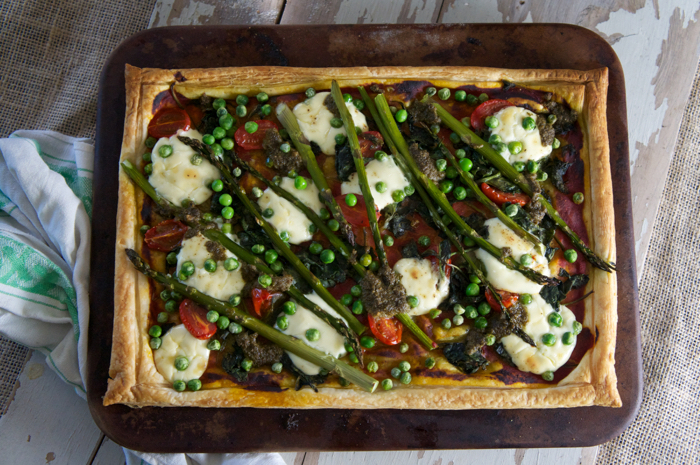 The ingredients for a quick tart can usually be found in the vegetable basket or fridge. A mouth-watering tart can be made from something as simple as onions, fried gently until caramelised, cooled then unceremoniously placed on top of a pastry sheet. The recipe for Onion and Taleggio Tart is simplicity itself and is always well received, either for a relaxed lunch or midweek supper. The onions can be cooked the day before, saving even more time on a busy evening. 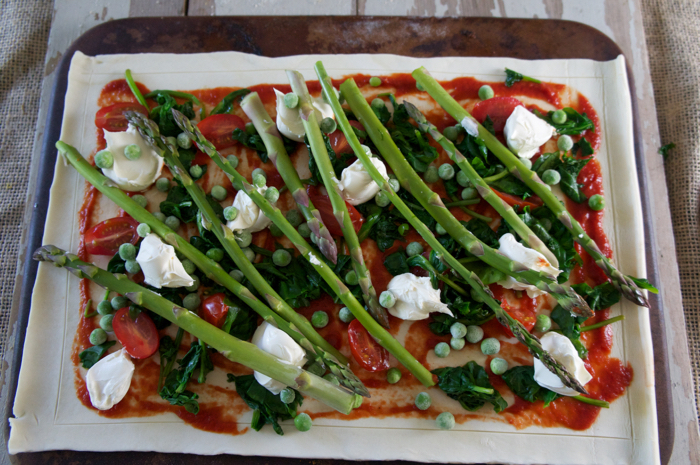 I was lucky that I had all the ingredients for this tart to hand, but if you do not happen to have asparagus, or if it is out of season, it is not the end of the world. Likewise, if your cheese box has goats’ cheese instead of mascarpone that will be fine too. If you don’t have pesto, try a few anchovies for a delicious salty kick, the recipe does not have to be followed to the letter. Although I would stop short of adding toppings like chicken tikka masala, that would make me cry. One of the reasons I started the blog was to try and inspire people to cook and that is not going to happen if every recipe takes an age to prepare or costs an arm and a leg. For beginners or those with little confidence in the kitchen, cooking for guests will probably seem a little daunting but if you start with something simple to make but spectacular to look at, you will enjoy your day and your guests will be delighted and impressed with your cooking skills. On a personal note, when I am busy in the kitchen preparing the rest of the meal, serving drinks, organising children, animals and elderly relatives, and generally making sure everyone is happy, I find it irritating (to put it politely) to hear constant requests for various kitchen implements, cloths, plates, bowls and and even more plates being shouted down the garden every two minutes by my husband. I think it must be something to do with wearing an apron, head chefs and all that. Still, after all is said and done, I really do hope that the sun decides to bless us with its presence this summer on a more regular basis as I intend to be a little bit more adventurous and exotic with the food I cook on our own little bbq this year. Watch this space. You will need a large study baking sheet. I used my own asparagus from the garden which did not require cooking beforehand, so if you do grow your own and it is very young and tender you will probably be able to use it raw. Blanch the asparagus for 2 minutes in boiling water and leave to cool. Unroll the pastry sheet and place it on the baking tray. With a sharp knife, make an indent all the way round the pastry about 1cm from each edge. Brush the edge with a little olive. Spread the passata over the base. Distribute the rest of the ingredients evenly, finishing with evenly spaced dollops of pesto. Place in the hot oven and cook for approximately 30 mins until the pastry is cooked and golden brown. Leave to cool slightly before serving. Best served lightly warm.